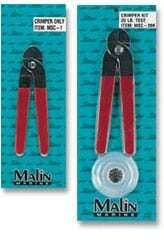 These crimpers are ideal for crimping single barrel sleeves. Crimp kits are available with 30 feet of 20 lb. to 60 lb. test Malin-7 or MALIN-7 and the proper sleeves.